FORT WORTH, Texas (Nov. 25, 2015) – Tarrant County College’s District Communications, Public Relations & Marketing team won four honors in the recent 4th Annual Worthy Awards. The Worthy Awards, hosted by the Greater Fort Worth Chapter of the Public Relations Society of America (PRSA), recognizes the region’s best in public relations and communications. Rogers and Tucker, along with Web Communications colleague Barbara Prellwitz, received an Award of Excellence for the #TCCGrads Campaign, which featured creative graduation cap designs by students on TCC’s social media outlets. In addition, Tucker and Web Development Manager Stephen Fornal created the TCC 50th Anniversary website, which also earned an Award of Excellence. Members of PRSA chapters outside of the region serve as judges for the competition. Entries are judged based on rationale, objective/purpose, execution and results. Additional competitions in which TCC’s CPRM team placed this year include the CASE District IV Accolades, Educational Advertising Awards, Graphic Design USA’s American Inhouse Awards and the PR Daily Nonprofit PR Awards. FORT WORTH, Texas (Nov. 13, 2015) – Tarrant County College continues its observance of Native American Heritage Month through November with campus events including dance, music and special speakers. Several campuses will host events on Nov. 17. At 11:30 a.m., “Native American Storytelling: The Tipi Tellers” will feature storytellers De Cee Cornish and Jaye McLaughlin in the Tahita Fulkerson Library at the Trinity River Campus, 300 Trinity Campus Circle. Telling stories with music and artifacts presents an unforgettable celebration of Native American heritage, bringing the past alive. From noon to 1 p.m., the South Campus hosts the Bear Claw Singers Drum Group in the Dining Hall. From 2 to 3 p.m., storyteller Eldrena Douma will share pueblo stories, songs and family history in the Living Room on the South Campus, 5301 Campus Drive. While on the Northeast Campus, the use of plants and herbs in teas, poultices and other forms for medicinal purposes will be discussed in “Tae Traditional Healing” on Nov. 17 from 12:30 p.m. to 1:30 p.m. in the NSTU 1506 at 828 W. Harwood Road, Hurst. Lisa Uhlir, Ph.D., professor of government, leads the discussion. Additional events include TCC alumna Alisa Tomlinson, playing her Native American flutes in the Walsh Library on Nov. 18 from 11 a.m. to 1 p.m. Northwest Campus, 4801 Marine Creek Parkway. On Nov. 19, the Southeast Campus, 2100 Southeast Parkway, Arlington, will host a Native American Heritage Event from 9:45 a.m. to 2 p.m. in the Main Commons. Live Native American dance and music will be featured along with a discussion on native artifacts. Refreshments are included. At the 28th Leadership eXperience Summit on Nov. 20 at 1 p.m. in the Trinity River Campus Action Suite, keynote speaker, branding and marketing strategist Chenoa Baryhdt discusses “Going Back to Native Ways for Personal Growth”. RSVP at http://tccd.student-hub.com or call Stevie Blakely at 817-515-1191. Wrapping up the month-long observance, on Nov. 24, Lisa Uhlir will lead a discussion of the dynamic increase in crime on reservations and the lack of response from the federal government. The discussion will take place at the Northeast Campus in NSTU 1615A, Center Corner, 12:30 to 1:30 p.m.
For Tarrant County College graduate Karen Medina, the need for considerable dental work during her childhood ended up changing the course of her life. After college, Medina went to work for the federal government, first as a technical writer and later as a manager with the Census Bureau. However, she never lost her interest in dentistry—so when Medina and her husband retired and moved back to Texas, she decided it was time to turn that interest into a new career. Medina considered going into dental hygiene but felt dental assisting was a better choice for her. Dental hygiene requires a longer education, with hygienists responsible for more advanced and independent procedures. Dental assistants generally work alongside a dentist, prepare equipment and handle administrative work. In spring 2013, Medina joined a long line of distinguished graduates from TCC’s Registered Dental Assistant (RDA) Program. Now marking its 25th anniversary, the RDA Program offers two sessions a year at Northeast Campus, with each class at capacity. It is quite a turnaround. 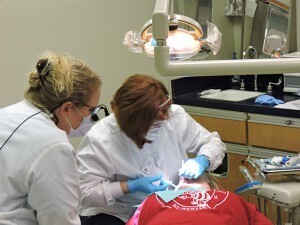 Originally, the Dental Assistant Program (as it was then known) was part of TCC’s college credit offerings. Due to low enrollments, TCC ended the program in 1986. The industry quickly felt the effects. TCC quickly responded. In 1990, the College began once again accepting students to the program, restructured to be part of noncredit Community & Industry Education Services. It had the support of area dental practices and professional organizations, and the College increased promotion at TCC and in the community. Six students were in the first class, and enrollment grew steadily from there. Paula Medford was among the early graduates. Medford liked the fact that TCC is an accredited college instead of a trade school. “Plus, it was a fast-paced program. I would be able to graduate sooner and start my career,” she said. During the intensive, 22-week course of study, students learn about dental anatomy, radiology, sterilization, laboratory procedures, preventive dentistry, nitrous oxide sedation, office management and more. After learning fundamentals in the classroom and lab, students practice their skills in actual work situations through a clinical externship. They also perform community service, including making dental health presentations and assisting dental hygiene students providing care to underserved children. Medford graduated from TCC in spring 1992. She worked in general dentistry, pediatric and orthodontic offices as a dental assistant. After several years, she found a new area of interest: dental sales. Medford transitioned to a sales position with Becker-Parkin Dental, then spent 14 years with Patterson Dental. Two years ago, Henry Schein Dental recruited her. Medford visits offices across the Metroplex, informing dental professionals about the latest equipment and supplies that will help them care for their patients’ teeth. Among her customers: TCC’s RDA Program. The program—renamed the Registered Dental Assistant Program in 2004 to reflect the registration requirement of the Texas State Board of Dental Examiners—is indeed one of TCC’s pride points. It has produced approximately 1,000 graduates over the past quarter century, meeting the needs of the local industry. 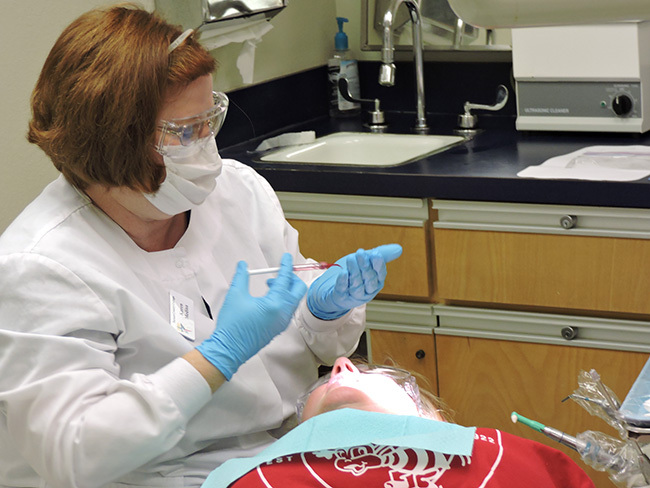 The demand for dental assistants will continue; the Texas Workforce Commission projects 29 percent growth in the Tarrant County labor market from 2012 to 2022, outpacing the average for all occupations. The RDA Program has developed partnerships with more than 60 Tarrant County dental practices for student externships. Dentists trust TCC, according to Dr. Ron Lee, a dentist who practices in Colleyville. A number of students have earned their clinical experience in Lee’s office, and each semester he works with students on campus to evaluate them in chairside and administrative scenarios. The faculty now includes Karen Medina, the former federal government employee who never lost her passion for dentistry. Medina joined the RDA Program as an instructional assistant after graduation; one semester later, the College hired her as an adjunct instructor. “My bachelor’s degree was in education, and I’ve always wanted to be an educator. This lets me work in dentistry and teach,” said Medina, who also volunteers as a dental assistant at a community clinic in Fort Worth. Semple says the success of the RDA Program can be attributed to the fact that its graduates are well rounded and exceed the expectations of the industry. In addition to the general RDA training curriculum, TCC offers professional development courses for practicing dental assistants. Learn more about the RDA Program, including admissions information, on the Community & Industry Education webpage. View photos from the program’s 25th anniversary celebration on Flickr. Kevin Henry, Rachelle Wanser, Stephanie Davenport, Lee Graham, Sammie Sheppard, Sultan Karriem, and Erin Casey. TCC Board of Trustees Institutional Planning Committee Meeting November 24 at 3:30 p.m.
Closed Meeting: Deliberation Real Property, Section 551.072, Texas Government Code. The Real Property discussion will address the purchase, improvement, exchange, lease or value of Real Estate to include recommendations from the Institutional Plan (Facilities and Academics Plan). FORT WORTH, Texas (Nov. 18, 2015) – Honoring its commitment to professional development and service to the community, Tarrant County College South Campus Community & Industry Education Services is sponsoring its 10th annual Ariel Hunter-Chriss African American Professionals Conference on Friday, Nov. 20. The conference, held in partnership with DFW Community Partners, will be held at TCC South Campus, 5301 Campus Drive. The continental breakfast and registration begin at 7:45 a.m., with the opening session starting at 8:35 a.m. The luncheon is from 11:30 a.m. to 1:15 a.m. in the Student Center dining hall. Workshops will be held from 10 a.m. to 11 a.m., 1:30 p.m. to 2:30 p.m. and 2:40 p.m. to 3:40 p.m.
Lorraine C. Miller, 35th Clerk to the U.S. House of Representatives, the first African American and third woman to hold the position, is the opening speaker. Miller also was the former Interim President and CEO of the NAACP in Washington, D.C. The luncheon speaker is Sheron C. Patterson, who has a doctorate in ministry. Patterson has worked 25 years as a relationship counselor, media personality and author. 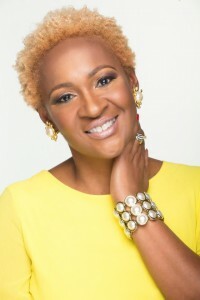 She has been featured in Ebony, JET, Essence and on national television’s CNN and BET. Locally, she is the relationship expert on WFAA TV 8’s Good Morning Texas. 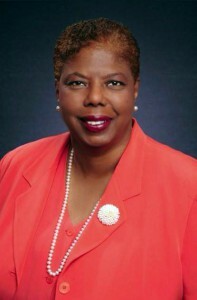 Named for founder Ariel Hunter-Chriss, Continuing Education Services director at South Campus until her death in 2009, the purpose of the conference is to provide leadership strategies and tools for business professionals, entrepreneurs and community leaders to manage career challenges created by diversified and global competition. Continuing Education Services is the former name of Community & Industry Education Services. By mail, checks should be made to Tarrant County College Foundation, please indicate Ariel Hunter-Chriss Scholarship Fund on the check on in an attached letter. Mail to: Alex Allred, TCC Foundation, 1500 Houston Street, Fort Worth, TX 76102. Conference sponsors and partners include Jim Austin Online, Minority Leaders and Citizens Council, Sam’s Club, Unity One Credit Union and Workforce Solutions of Tarrant County. Registration for the conference is $69 for professionals and $39 for students. To register, contact Alisa Jones at alisa.jones @tccd.edu or 817-515-4598. FORT WORTH, Texas (Nov. 16, 2015) The Tarrant County College Board of Trustees today announced a national search for a chancellor, the top administrative leadership post at the institution, which is the 12th largest institution of higher education in the United States. Board members approved the development of a Request for Proposal (RFP) for a professional chancellor search firm. TCC General Counsel and Vice Chancellor Angela Robinson has been serving as acting chancellor since TCC Chancellor Erma Johnson Hadley passed away in early October. The board expects to select a search firm in early 2016. “The Board will continue to communicate with students, faculty and staff and the community throughout the process,” Appleman said. When The T visited Tarrant County College Northeast and Northwest campuses last month, it was not for ordinary pick-up and drop-off visits. The T, Fort Worth’s Transportation Authority, made it easier for TCC students to voice their transportation needs by bringing its Master Plan Project Bus to them. The mobile surveying center toured around town about five months, making stops at local events and institutions. The T Master Plan will evaluate existing transit service and demand, identify opportunities to expand transit service, lay the groundwork for project development and funding processes and determine a schedule for moving forward. The plan is scheduled to be completed by the end of the year. Fifty-eight Northwest students and 84 Northeast students were among the 590 respondents who weighed in. Students of all ages and backgrounds, from walkers to riders to drivers stopped by to give their opinions on how to improve The T system. You may learn about initial survey findings and about the strategies planned for ways to improve the T at the Master Plan presentation on Wednesday, Nov. 18, at 11:30 a.m. and 5:30 p.m. at the Intermodal Transportation Center, 1001 Jones Street, Fort Worth, TX 76102. Presentations are scheduled to begin at noon and at 6 p.m.
HURST, Texas (Nov. 13, 2015) “E3 Summit: Mapping Our Resources – Entrepreneurship, Education and the Economy” is the theme for the 19th Annual Heart of North Texas Business Conference on Friday, Nov. 13. Hosted by Tarrant County College Northeast Campus Community & Industry Education Services (CIES) the conference will be held at the Larry Darlage Center Corner, NSTU 1615A, 828 W. Harwood Rd., in Hurst. Mark Milliron, Ph.D., co-founder and chief learning officer for Civitas Learning, is the keynote speaker for the noon luncheon. The breakfast speaker is Rick Smyers, president of the Center for Communities of the Future. Registration and the continental breakfast for the half-day conference is at 8:30 a.m. Sessions are from 9 a.m. to 1 p.m. The registration fee is $50. For more information, contact CIES at 817-515-6502. Tarrant County College Campuses are hosting Veterans Day observances in honor of those who have served or are serving our country. The Southeast Campus, 2100 Southeast Parkway, Arlington, will dedicate a Blue Star Memorial Marker in tribute to the Armed Forces. Located in the center of the English Family Rose Garden at the south entrance to the campus, the marker is sponsored by District II of Texas Garden Clubs. Funds for the marker were raised by the SE Campus Veterans’ Association. The dedication takes place in the Main Commons at 11 a.m.
TCC alumni and U.S. Marine Corps veteran Aaron Throckmorton will speak at a lunch for veterans at the Northwest Campus, 4801 Marine Creek Parkway. Throckmorton enlisted in the Marines after the Sept. 11, 2001, terrorist attacks on the United States. He served in two tours overseas, one of which was in Afghanistan. Once he retired from the military, he attended TCC, where he completed his associate degree and is currently in his final year of his bachelor degree at The University of Texas Arlington. For the first 75 TCC students who are veterans, lunch will be provided in WSTU 1305 from noon to 1 p.m. RSVP to Keva Montrose at 817-515-7672. The Trinity River Campus, 300 Trinity Campus Circle, will begin a National Roll Call Presentation and Moment of Silence in the Rotunda from 10:45 a.m. to noon. A Veterans Day luncheon will follow, featuring J’Nell Pate, author of Arsenal of Defense: Fort Worth’s Military Legacy. The luncheon will be held in the Tahita Fulkerson Library. RSVP to www.TCCD.student-hub.com.